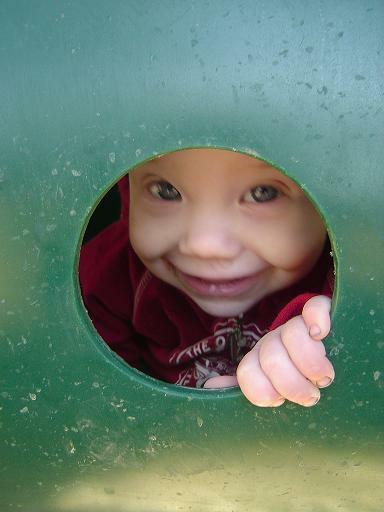 Luke loved climbing through the tunnels on the playground! No peeking! No, they’re not “tree huggers” but it’s a tradition to take pictures of all the kids that have climbed the tree in Mom’s front yard. I even have a few pictures of my 38 year old sister in the tree……I need to find those! 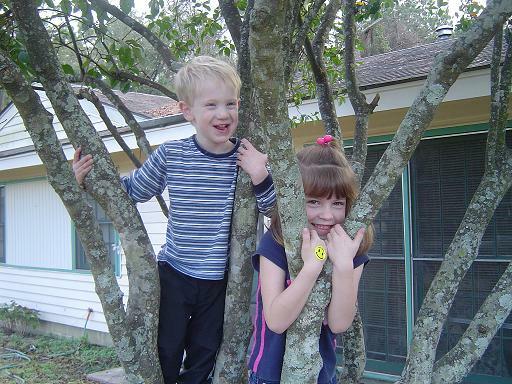 Here, Andrew climbs high with his cousin, Emily. I don’t want to share! 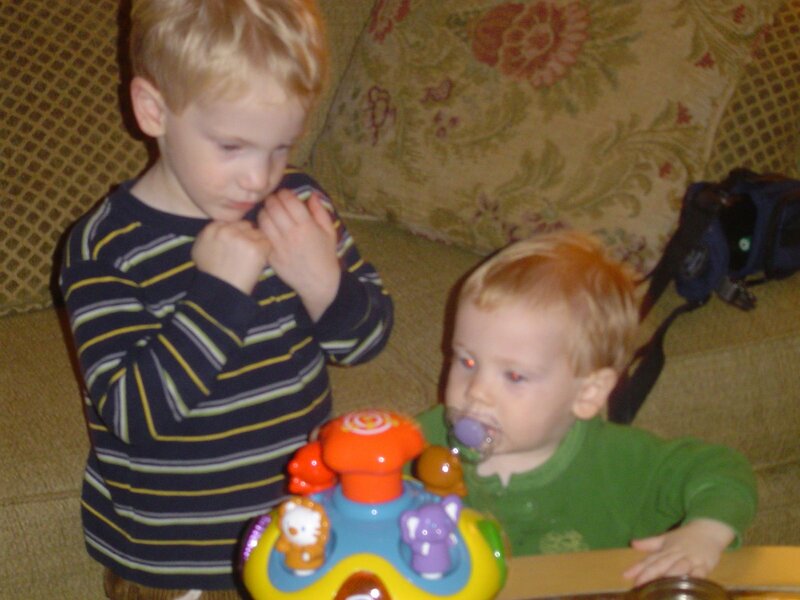 Brothers who love each other but have a difficult time sharing. Luke is such a good rider. 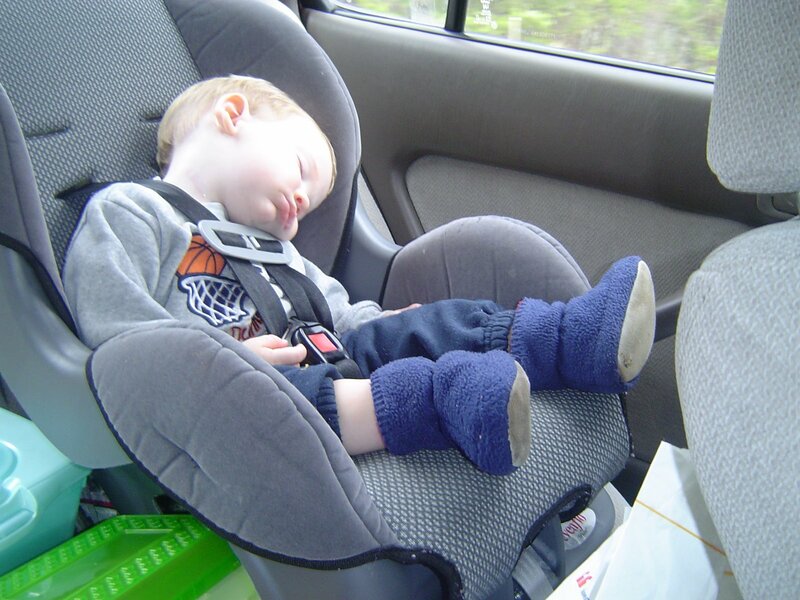 He often falls asleep best when riding in the car…especially long distances like the trips we take at Christmas. SNORE! This is the attempt Mitch’s parents made to have their picture taken with their four grandchildren. It makes me laugh. This would not be the year of our Lord 2006. We would never hear a single Christmas carol or Handel’s Hallelujah Chorus. No city would be named St. Paul or St. Petersburg or Corpus Christi. We would have never heard of William Tyndale, John Wycliffe, John Knox, Martin Luther, John Calvin, John Wesley, John Hus, Billy Graham, Elizabeth Elliot, Amy Carmichael, Corrie Ten Boom, Fanny Crosby, Alexander Solzenitzen, C.S. Lewis, Chuck Swindoll, C.J. Mahaney, John Piper, or… make a list of your own. There would be no organizations such as Wycliffe Bible Translators, Campus Crusade for Christ, InterVarsity Christian Fellowship, Navigators, Bethel University, KTIS, The Red Cross, Methodist Hospital, The Salvation Army, Christian Book Sellers Association, National Association of Evangelicals, Princeton, Harvard, Yale, Purdue, and countless others. We would have no such books as Tale of Two Cities, Dickens’s Christmas Carol, or even The Grinch Who Stole Christmas. We have no movies such as Ben Hur, The Cross and the Switchblade, Chariots of Fire, Narnia, and scores of others. Idioms would never have been brought into our language such as the Good Samaritan, the prodigal son, lost sheep, or any of Jesus’ other parables. We would not have teachings that have entered our every day speech such as turn the other cheek, go the second mile, do unto others as you would have them do unto you, and love your enemies. It’s unlikely that this continent would have seen the arrival of the Pilgrims, and if they had come by some other name, years later President Washington could have been King George instead. It could be easily argued that the United States Founding documents would not be what they are. The Wuaorani Indians of Ecuador would still kill white men instead of baptizing their children. The Arawakan Indians of the Caribbean would still be cannibals. Descendents of the Mayans in Chiapas, Mexico, would still sacrifice their children instead of teaching them to praise the true Creator. Prophecies would remain unfulfilled, the serpent would not be crushed, we would not be delivered, and God would be a liar. Death would not be conquered. The New Testament would never have been written. There would be no mediator between God and man, for the man Christ Jesus would not have been born. We would remain dead in our trespasses and sins, the veil not yet rent. 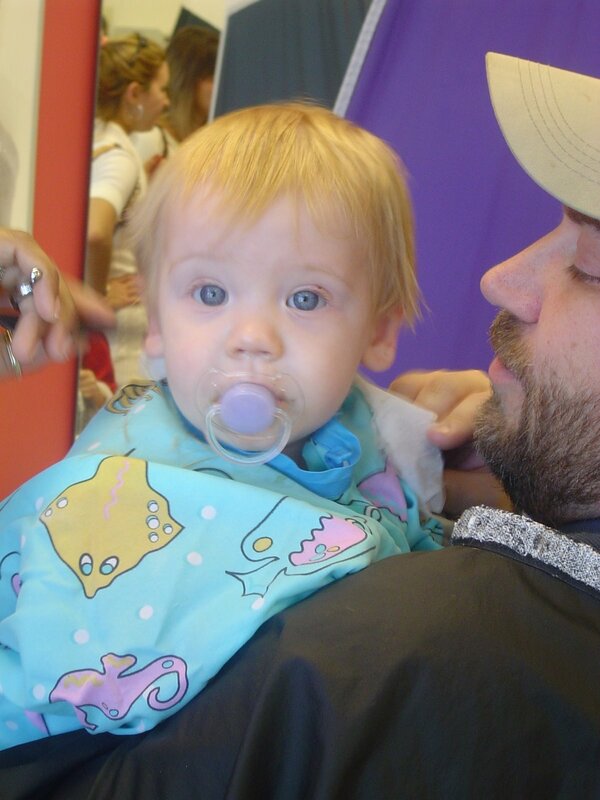 Both boys were long overdue for a haircut. 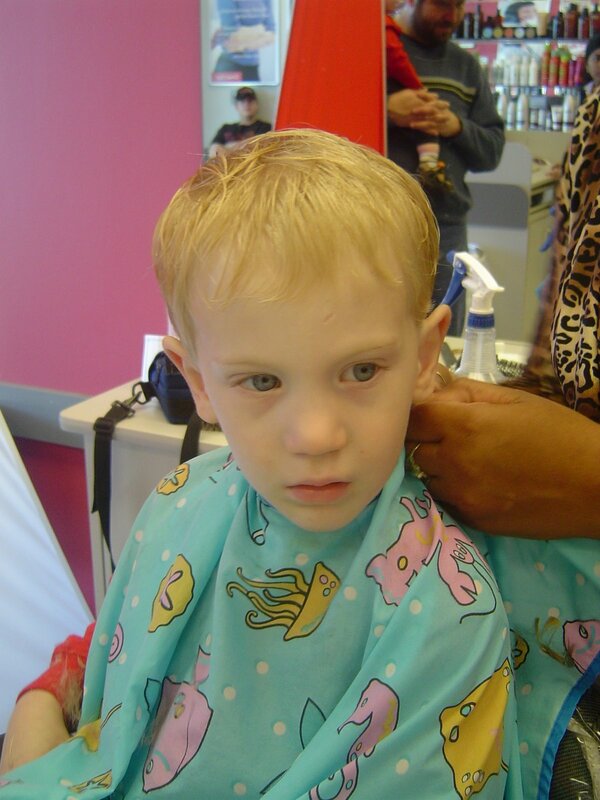 It was Luke’s first cut in his life and he did extremely well. He started out in Daddy’s lap and then moved to mine. Andrew is a pro…this was his fifth cut, I think. Aren’t they handsome?